Organization probably isn’t my strongest attribute in my woodshop but I do give it a solid effort. A lot of the hand tools that I use are stored on my pegboard on my side wall, including my bench chisels. In the past, when I would need a different sized chisel I would have to make trips to the pegboard from my bench. In order to fix this time waster, I decided to make a chisel rack for all of my bench chisels. This way, I could bring my entire set of bench chisels over to my bench in one shot. 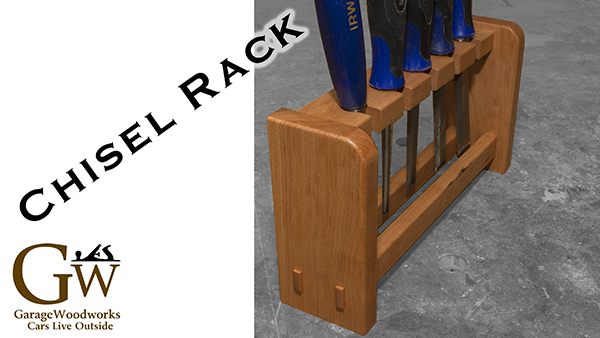 The entire chisel rack was made from scrap cherry and didn’t require very much of it. It was designed so that the bevel side of the chisels would be prevented from rocking and would be trapped between two rails. For those rails I decided to use through tenons and I made them 1/8″ proud of the surface where they exit. The entire project was made using integral tenons, which is a rarity for me. I finished the project with General Finishes Arm-R-Seal which has quickly become my favorite finish. Watch the build video here.